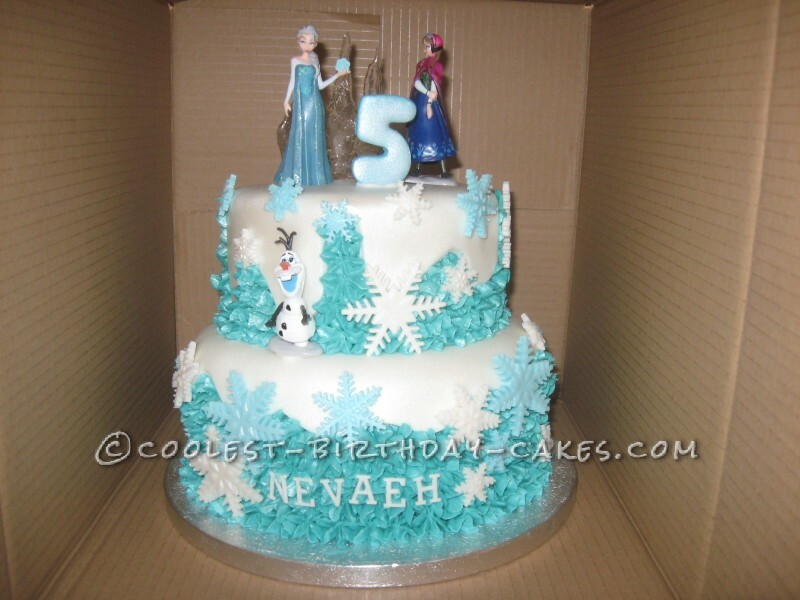 This Disney Frozen birthday cake is an 8-inch and 6-inch chocolate sponge cake put together with chocolate butter cream. I then crumb coat with blue butter cream, then cut the white fondant for the top. piped the butter cream around with flower nozzle. I sprayed the whole thing with silver edible spray to get the sparkle effect. The snowflakes were made a few days before to set. I used the cutters for them in blue and white, then sprayed with the spray. The lettering was done with funky letters used sugar paste. The ice on the top was done by using Fox’s glacier mints melted in the oven and stretched with a knife to make a point, be careful it gets really hot. 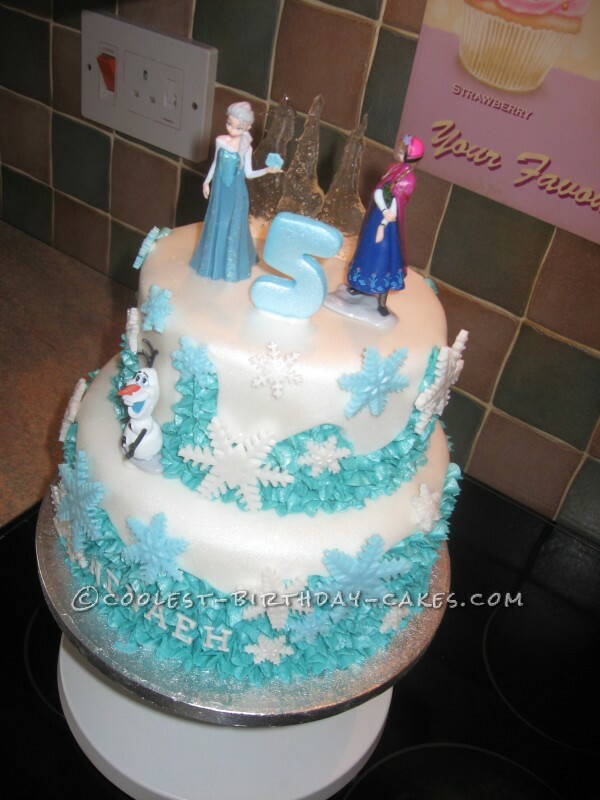 Once cold, you can stand in the fondant on top of cake really looks the part and works well. Then arrange the figures. The blue figure was made with fondant with added gum tracker then left for a few days to harden, then easy to stand using royal icing. I had to practice with the glacier mints a couple of times and didn’t know if they were going to melt or not, but they worked well. My practice ones I stood in fondant, they last days. they do get sticky after a few days but would have done the job by then. The hardest part was the white fondant icing cutting to shape and getting it right to look like the snow. It all came together in the end and I was well impressed with the end result. I had lots and lots of comments on it and everyone enjoyed it not only the decoration side but the taste has well. The young lady was so happy and I was told her little eyes lite up with delight. I’m not a professional just a hobby for me .